In 2005 we organized and led another tour group to Russia. This time we joined a group conducted by Vantage Tours for a cruise on the Volga and northern Russian lakes and rivers between Moscow and St. Petersburg with a few extra days spent in each of those cities as well. The cruise was on the Nikolai Chernishevski, a 220 plus passenger liner leased every year by Vantage that it uses to conduct 9 or 10 such cruises each summer. This was a new and different type of tour for Xenophon, as in the past we have always conducted our tours independently rather than join a commercial tour group. We were delighted with all aspects of the Vantage company tour and recommend the company. 30 June - excellent full buffet breakfast (repeated every day) and then bus tour through traffic with photo stops including the Novodevichi Convent and Cathedral of Our Savior, then walk through Red Square to lunch at fine restaurant built into the Kitai Gorod wall. After lunch, walk through Kitai Gorod and then metro back to ship for dinner. After dinner bus to marvelous performance of Boris Gudunov at the Bolshoi Opera. 2 July - Morning tour of the Kremlin Armory museum and then Cathedral of Archangel Michael and grounds. Back on board the Chernishevski we started the cruise around dinner time. We passed through the first two ofthe 6 locks on the Moscow-Volga canal before dark. 3 July - The ship passed from the canal to the Volga, by mid-afternoon we reached Uglich. We departed town at dinner time and continued down the Volga all night. 4 July - Morning we arrived at Yaroslavl for a half-day tour. Back on board the Chernishevski after a too-short visit to this wonderful city. In the afternoon we passed the Tolgski Convent and the many lovely churches in Romano-Borisoglebsk, then around 6 PM reached the hydroelectric plant, dam and locks at Rybinsk. After dinner, while cruising across the Rybinsk reservoir we had a special treat with a reception on the sun deck complete with fireworks in honor of Independence Day. 5 July - We cruised along the Sheksna River, passing the Resurection Convent at Goritski.. On board we had Russian language classes and Vodka tasting. 6 July - During the night we passed through the canal between White Lake and Lake Onega. During the morning we crossed Lake Onega and arrived at Petrozavodsk in the afternoon. We had a bus tour of the town and then attended an excellent performance ofa Karelian folk show. The evening dinner on board was a real 'surprise' party. During the night the ship cruised to Kizhi Island. 7 July - At dawn we were at Kizhi Island fora full morning walking tour of the architecture museum. During lunch we started cruising across Lake Onega. There was another class in painting Matroshka dolls. Then we had a Russian tea party before dinner. 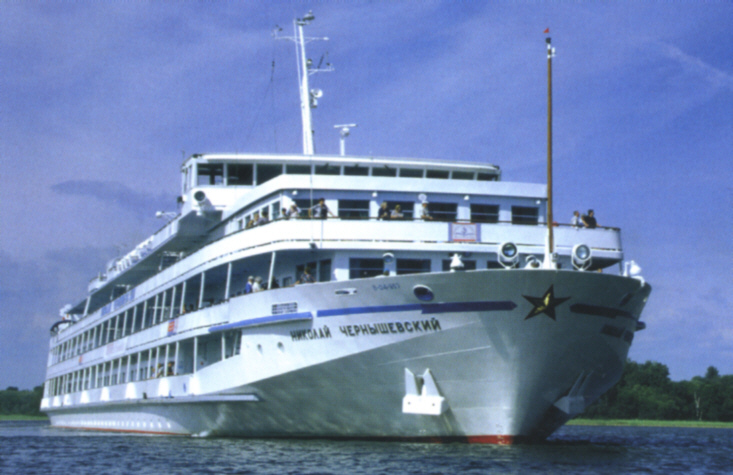 The ship entered the Svir river for a slow all-night trip. 8 July - at dawn we were at Mandrogi, a relatively new tourist stop. We departed at 1 PM. That evening the captain hosted his 'farewell' reception on the sun deck. We entered the Neva River around 2AM. 9 July - We docked at St. Petersburg around 8 AM. After breakfast we had a bus tour of the city with stops along the Neva and for a guided tour of the Peter and Paul fotress and cathedral. We spent the rest of the day walking around the downtown and visiting the Naval Museum and Artillery Museum before evening mass at the Church of St. Catherine in Nevski Prospect. 10 July - We spent the entire day in the Hermitage Museum - Winter Palace. Then, after dinner, we returned to attend a performance of Giselle at the Hermitage Theater. 11 July - We took a morning bus ride to Peterhov for a 1/4 day tour of some sections of the huge grounds including the 'Catherine block". In the evening we attended a fine symphonic performance at the Marienski Theater. 12 July - Another morning bus ride took us to the Catherine Palace at Tsarskoye Selo and after lunch a tour of the Pavlovsk Palace nearby. 13 July - Before dawn we departed the N. Chernishevski for the airport. We flew back to the US via Paris. Photography from previous visits and extensive text descriptions and historical background are in the sections on Ruscity and may also be found from the index at xenophon.